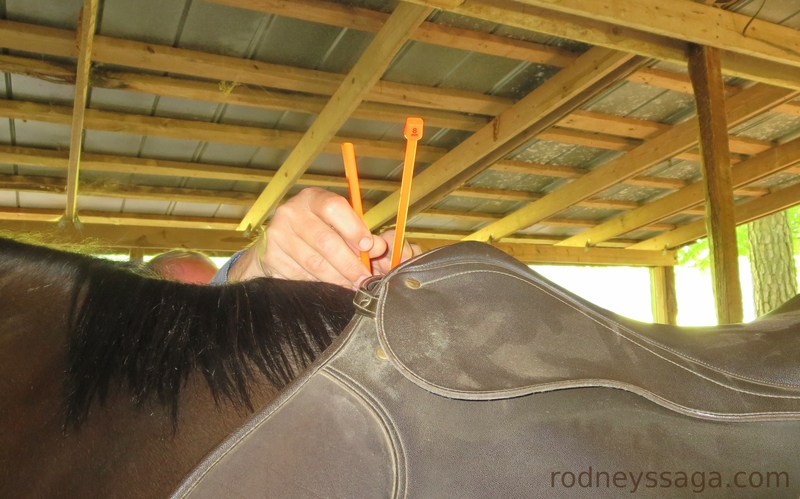 Rodney had a saddle fit appointment last Saturday. Fred Melnick of Melnick Saddle (saddle evaluation and fitting, billet replacement, saddle reflocking. 205-913-3841 fgmel@aol.com) came out with his bag of tools and several saddles. First off, his angle widget indicted that Rodney’s back is wide to extra-wide. This surprised us. No horse with such high withers should need a wide saddle. A while back, Rodney had worn my old, narrow, jumping saddle during his ground exercises. It looked like a racing saddle perched on an elephant. Utter ridiculous. Plus the girth shot off in a weird direction. I didn’t know enough about saddle fitting to identify the problem. I just knew it wouldn’t work. That no saddle would ever work. That this horse would never be ridden. Same old. Same old. Fred brought out a Wintec All-Purpose that sat beautifully on Rodney’s back. He showed us how the billets lay straight and explained that Rodney’s physiology meant that the girth would always sit farther back than on most horses. He recommended using the second and third billets rather than the first and third as I had been taught. A point billet was right out. Wonder of wonders. It fit. It looked good. It looked as if someday, someone might actually be able to ride in it. Fred kindly left us the saddle to work with for a few weeks. Whether we use this one, another copy of this model, or a different brand altogether, we now know that a solution is possible. That makes a huge difference to a search. To test-drive the theory, my top hand long-leadlined Rodney over some low fences. Walk in. Pick up a jog. Hop over. Glide smoothly back to a walk. Pause to be admired. He could not have jumped better. Perky & enthusiastic yet calm & confident. The best jumping he’s done with us. So, the saddle did not bother his back. Good to know. In order to demonstrate Rodney at his worst, I took over to trot him in-hand. I even aimed away from the barn to maximize the chance of a fuss. You can see where this is going, yes? Rodney picked up a beautiful trot and bopped down the field as if this was the simplest thing in the world. He tossed his head for the first micro-instance of the first step. It was such a tiny echo of his standard melt-down that those of us who know him could see it only because we were looking for it. 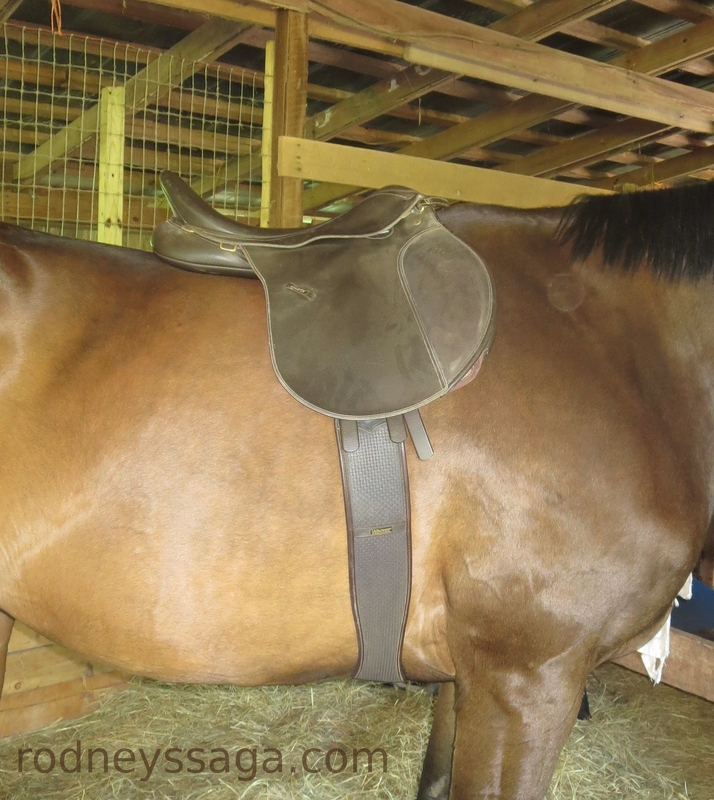 Afterwards, Fred tested a western saddle and an endurance saddle. Neither fit as well as the all-purpose. If only one saddle was going to fit, that’s the one I would have picked. I’m not sure what we would have done if Rodney had gone well in the western saddle. Taken up western dressage? On a side note, Rodney gave the western and the endurance much more of the hairy eyeball than he gave the Wintec. Because they were bigger? Because they didn’t fit and therefore didn’t feel as good? I wonder if it was because they were leather and the Wintec was synthetic. I wouldn’t think this could matter except that Rodney was such a wingnut about his leather halter [Slow Lane, Here We Stand]. The smell? The sound? A coincidence? 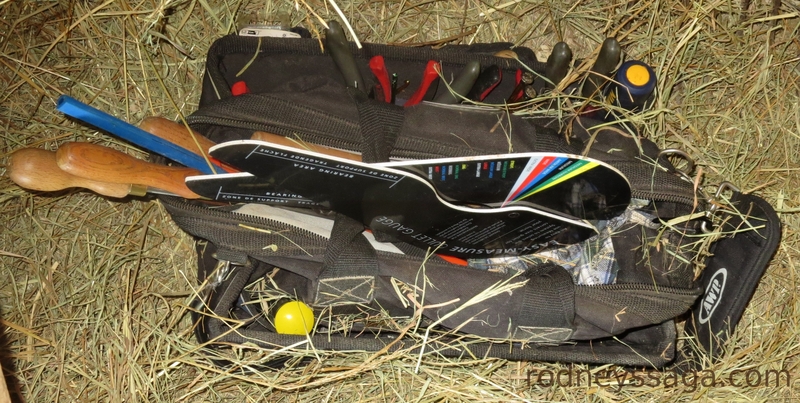 Once the saddle fitting session was over, Rodney got a massage tune-up from Sharon Melnick, Fred’s other half and a licensed massage therapist [Masterclass]. (No contact information. I’m trying to convince Sharon to go commercial, but no luck yet.) Rodney yawned. I watched and learned. Sharon’s approach is different from mine, deeper into the muscle but more methodical. It’s good to be shaken out of one’s ruts from time to time. When it was all over, I took Rodney’s halter off. He waited to be sure he was dismissed and then ran off like a kid headed to recess. More news about Rodney tomorrow. Stay tuned. 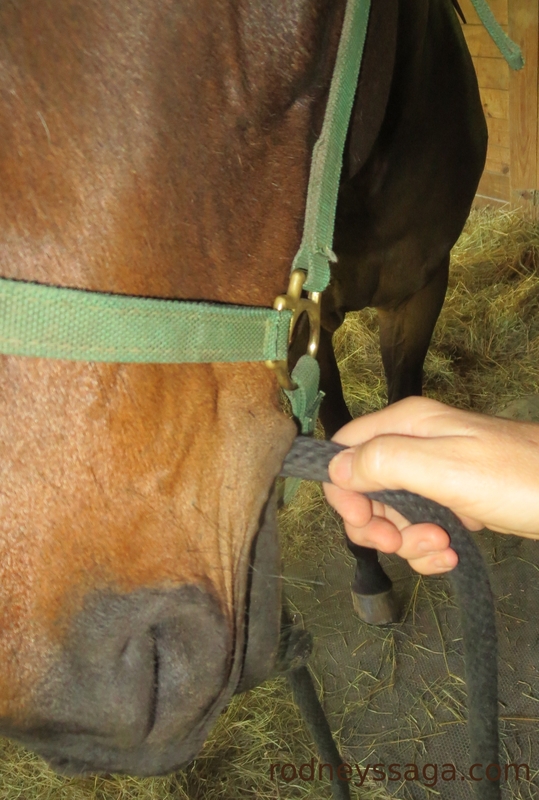 Rodney chews his leadrope like a binky when he’s stressed.